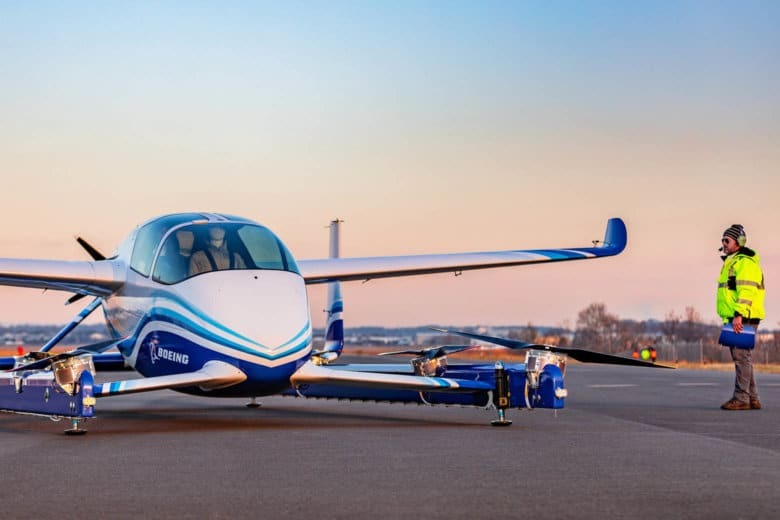 Tuesday's flight was the first step in what Boeing calls tests to advance the safety and reliability of on-demand autonomous air transportation. The flying car concept is being developed with a vision of whisking passengers quickly from one point to another while alleviating traffic congestion on city streets. WASHINGTON — Boeing’s vision of an airborne Uber took to flight Tuesday at the Manassas airport. The first test flight of the aerospace company’s autonomous passenger air vehicle prototype, developed by Manassas-based Aurora Flight Sciences, completed a controlled takeoff, hover and landing during Tuesday’s test. The vehicle is powered by electricity and takes off vertically. The fully autonomous craft has a range of as much as 50 miles, according to Boeing. Tuesday’s flight was the first step in what Boeing calls tests to advance the safety and reliability of on-demand autonomous air transportation. The Passenger Air Vehicle, or PAV, will next be tested for forward, wing-borne flight, what Boeing calls the most significant engineering challenge for any high-speed vertical takeoff and landing craft. Boeing acquired Aurora Flight Sciences in 2017. The prototype is 30 feet long and 28 feet wide. The flying car concept is being developed for urban passenger transportation with a vision of whisking passengers quickly from one point to another while alleviating traffic congestion on city streets. Boeing’s urban air mobility division, Boeing NeXT, and Aurora Flight Sciences are also developing an unmanned fully electric cargo air vehicle designed to carry up to 500 pounds. That vehicle completed its first indoor flight test last year and will begin outdoor flight testing later this year.